Size:11'6 x 32" x 6"
11'6 x 32" x 6"
Bote has been making inflatables that have innovated the market for several years now! This year they further refined their Drift model, making it even more awesome than it was. 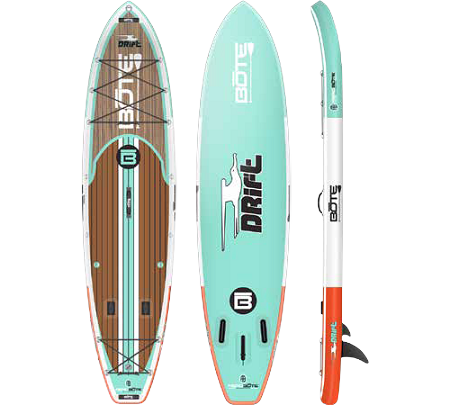 With 32” of width and tons of Volume, the drift has plenty of stability allowing you to fish, do yoga, load it with gear for an extended trip or just go for a relaxing paddle. It’s rated for 350 lbs. so you have plenty of excess to carry your gear under the front and rear bungees. This year Bote has also integrated their Travelink System into the drift. There are two clip on rings on the side of the rail that allow you to attach a shoulder strap to help you easily carry your board to and from the water. The shoulder strap is another OPTION that can be purchased separately. Like last year’s model, this year they continued with the tie down rings located just in front of the tackle rack attachments. These are in the perfect spot to strap down your favorite cooler and stash your food or store your fish! 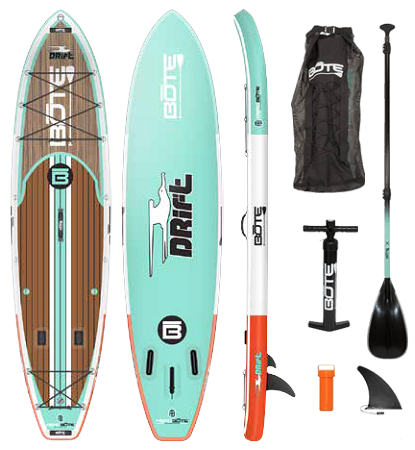 In addition to all the awesome features found on all their inflatables, the Drift also come as a complete package and includes a durable travel bag, pump, repair kit, center fin and an adjustable paddle. 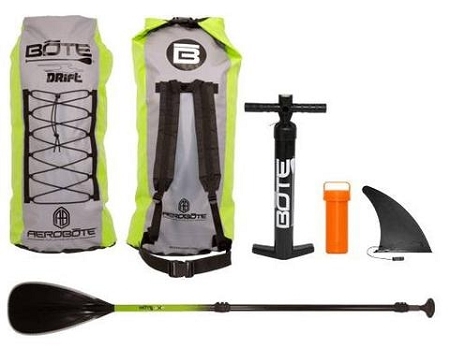 Bag - The bag included with the Drift also serves as a dry bag that you can use to keep your extra gear dry on your paddling adventure. The travel bag also features backpack style shoulder straps for easy transport no matter where you go. Bungee tie downs on the front will allow you to easily take accessories with you. Paddle - The adjustable paddle is lightweight and durable. Since it's adjustable, it's always the perfect size. The paddle is another area that upgraded in comparison to last years. You’ll be a lot happier with this one! Note: The bag & paddle shown here is for a Drift classic. The color of the bag will match the style of the board.